Check out Smart Diapers, and Briefs. 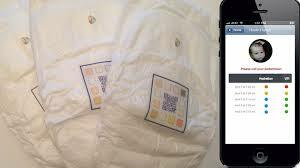 Outfitted with special QR code that is scanned once a day, these protective garments instantly begin to analyze the data, looking for signs of UTIs, dehydration and developing kidney problems in the children, or adults that wear them. By utilizing the data from a wet Pixie Diaper or Brief, you can make use of something that would normally be thrown into the trash. The Pixie Brief or Diaper, and it’s associated application will automatically look for emerging trends in your loved one’s health, and will alert you to some of the conditions that may require a physician’s attention. Infants, Alzheimers patients, folks with diminished capacity, or the inability to communicate could all benefit from a wearable device that could alert caregivers to potential problems with dehydration, kidney function, or urinary infections, that have the ability to turn catastrophic very quickly. Now, while you can’t find any of these diapers next to the nappy’s on store shelves just yet, if you are taking care of an aging adult, there is an ongoing pilot project you may be able to able to take advantage of, but for babies, you needed to be an early adopter of the indiegogo.com Smart Diapers campaign and then, for around 25 bucks, your kiddo would have been sporting some high tech potty pants one day mid summer.